In 1998 AOL paid $287 million to acquire ICQ, a pre-revenue instant messaging (IM) client with a "massive" base of 12 million users. In just three years ICQ's user base grew to 100 million, but it never seemed to take off as a business. 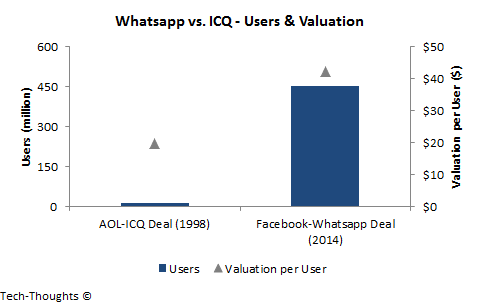 Over the past few months, some observers have drawn parallels between the valuations drawn by dot-com era products like ICQ and smartphone messaging apps -- Whatsapp's $19 billion valuation is usually part of the argument. In reality, there are major differences between the dot-com bubble and what we see today. Let's begin with the obvious -- the chart at the top of this post shows that mobile services operate at a scale that is far larger than services from the PC-era. Whatsapp has already reached 465 million users and recently hit a new record after processing 64 billion messages in a single day. LINE just passed 400 million users with a record of 10 billion messages processed in a day. While these numbers certainly dwarf those of dot-com era services, it still doesn't tell why their business models are more sustainable. IM clients never evolved beyond simple, text-based communication tools where banner advertising (the primary revenue model) was a poor fit. This is because advertising works best when it is consistent with content or context, preferably both -- neither of which was true for IM clients. The only way to make advertising more effective was to enable in-stream ads, which would have resulted in a poor user experience and lower consumer engagement. As a result, chat services in the dot-com era received the lowest advertising rates of any internet service. Today's messaging apps hold two key "environmental" advantages over chat services from the dot-com era. First, access to cohesive software ecosystems (a.k.a. appstores) gives them an obvious way to monetize their reach. By lending their scale to app developers (and linking directly to trusted appstores), messaging apps could demand a share of in-app purchase revenue. In contrast, the fragmented software distribution model in the dot-com era made monetizing digital goods much more difficult. Second, IM clients could only be accessed from a (mostly) stationary PC while smartphone messaging apps can be accessed anywhere. In other words, messaging apps are much more likely to be used in contexts where commerce is relevant. It is the power of context that enabled WeChat to become a player in mobile payments and e-commerce. It also helped KakaoTalk and LINE enable direct brand-to-customer communication with very effective results -- coupons sent on KaokaoTalk saw redemption rates as high as 8%, while commercial messages sent on LINE saw open rates of 50%. Unlike chat services from the dot-com era, smartphone messaging apps already have proven monetization models with exponential revenue growth. In 2013, KakaoTalk generated $200 million in revenue, while LINE generated $338 million. Based on their growth trajectory, they could conceivably reach $1 billion in revenue this year. Whatsapp's conservative, subscription-based revenue model is an exception, but the product has similar revenue potential because of the monetization opportunities available. All the dot-com ideas were correct. They were all too early. They are happening now. I don't have enough knowledge about the broader tech industry to comment on all dot-com ventures, but AOL and ICQ certainly had the right idea. Their only problem was that the right monetization models could only be implemented in the mobile computing era.